Today we are going to understand how to persist a collection object based on a Set collection interface i.e. HashSet, within the database using Hibernate. HashSet stores the collection of elements in an unsorted order. Why do we have to add a collection object in an Entity class. Let's suppose we have a class Companies containing the information such as - id, name and a Set collection of String object(representing names of all the employees of a particular company). That's why we are going to need a collection object in Companies class, representing multiple employee names in a company. Let's put this example to work and make it easier for you to understand the whole concept. 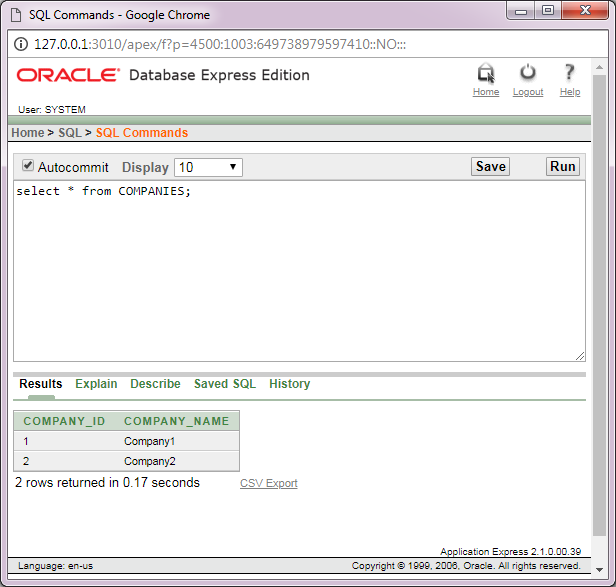 In the upcoming example, We are going to create a Java Entity class which will be mapped to a table in our database(Oracle Express Edition 10g). To perform this, we are not going to use Hibernate Annotations, we will instead create the mapping-resource file with extension hbm.xml. And yes, one more thing, we are going to create this program in an Eclipse Integrated Development Environment (IDE), though you may use any IDE of your choice. We are creating a simple Java Entity class whose objects are also known as Plain Old Java Objects(POJO) or Entity objects. The objects of this class(containing the HashSet collection object) need to be persisted/saved. 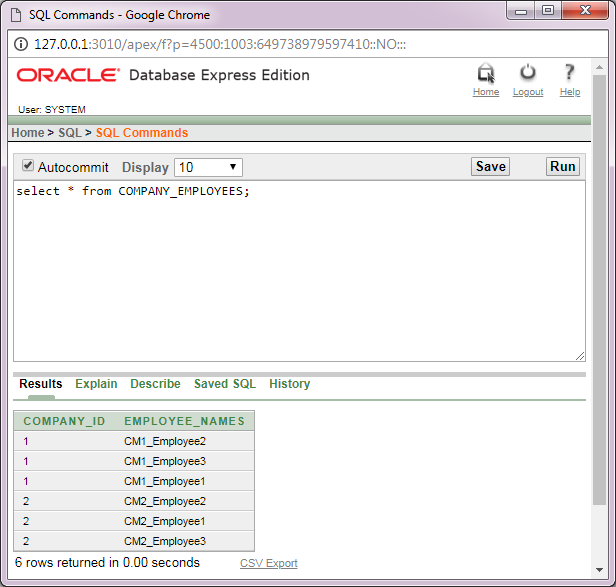 This collection object is stored in a separate table, while the Entity object is stored in a separate table in the database. Some may even refer to this Entity class as the Model class. This class Hiber.java will create an object of Companies Entity class , which will be persisted using the Hibernate API and an object-relational mapping(ORM) in the database is performed. //Creating a new Session to retrieve the objects. 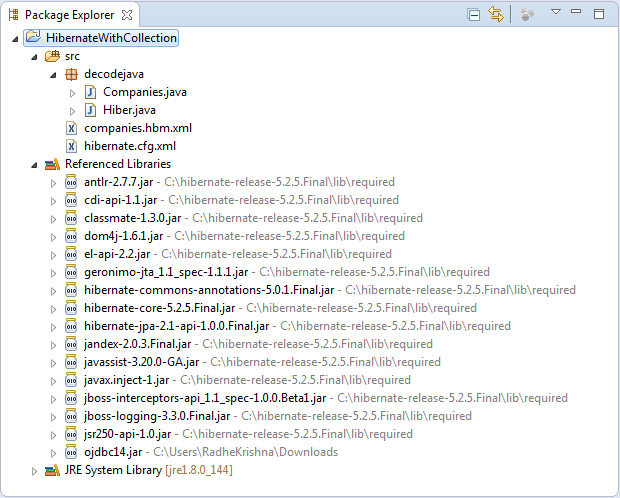 All these JARs are included in the folder named required(within the Hibernate installation folder). So, we need to add all the JARs in the required to our build path of our Java project. Next, we are going to create and add a mapping-resource file within our package decodejava. This file allows Hibernate to map the Model/Entity class to a table in the database and perform the object-relational mapping. This mapping document ends with an extension .hbm.xml, hence, we have named it companies.hbm.xml. The name of the class to be mapped to a database table. The name of the database table to be created. The specific field, which is to be made the primary key in this table. The data-type of each property in the class, which is going to mapped to a column in a table. This mapping document has <hibernate-mapping> as the root element and its child element <class>, containing all the class elements. The name attribute within the <class> element defines the name of the class to be mapped to a database table. The table attribute within the <class> element defines the name of database table to be created for the class. The id element maps a property within the class to the primary key of the database table. the name child attribute refers to the name of a property in the class. The column child attribute refers to name of a column in the database table. The type child attribute specifies the data type of the property within the class, which will be mapped to SQL data type. The property element maps a property within the class to a column in the database table. The column child attribute refers to the column name in the database table. The set element maps a Set object to be saved in the another database table). the name child attribute refers to the name of a property to map. The table child attribute refers to the name of the table in which this Set object will be saved. The element child attribute refers to the column name that will be created to hold Set collection of objects and their type. The mapping resource file used by Hibernate to correctly map the parent and subclasses to a database table. The picture above depicts how and where to arrange POJO/Entity(.java) file and the other the class(that calls the hibernate into action) in a specific directory structure. Project Folder - HibernateWithCollection is the name of our Project and it is a top-level directory. This project folder contains the main package of our project i.e. decodejava, which contains POJO/Entity class file i.e. Companies.java and the class that calls the hibernate into action i.e. Hiber.java. Besides this, the project folder also contains the hibernate configuration file i.e. hibernate.cfg.xml, and as we have not used Hibernate Annotations in this project, hence, we have created and used a mapping-resource companies.hbm.xml . COMPANIES, which stores the Entity objects. COMPANY_EMPLOYEES, which stores the Set collection object. And you will get the following output, which shows the collection of employee names retrieved in a unsorted order. Hibernate: select companies0_.COMPANY_ID as COMPANY_ID1_0_0_, companies0_.Company_Name as Company_Name2_0_0_ from COMPANIES companies0_ where companies0_.COMPANY_ID=? Hibernate: select employeena0_.COMPANY_ID as COMPANY_ID1_1_0_, employeena0_.Employee_Names as Employee_Names2_1_0_ from COMPANY_EMPLOYEES employeena0_ where employeena0_.COMPANY_ID=? you will get the following output displaying the objects of COMPANIES Entity class stored in COMPANIES table, as shown below. you will get the following output displaying the Set collection object of type String, stored in COMPANY_EMPLOYEES table, as shown below. This output shows that each object of COMPANY_EMPLOYEES and all the names of employees under column Employee_Names are sorted in an unsorted order.